We have frequently written about the expansion and subsequent contraction of the U.S. farm income. While most of our previous work has focused on sector-level trends across the U.S. farm economy, we have anecdotally noted these trends likely vary at the local, state, and regional levels. Thinking about these variations, we previously looked at how changes in farmland values have varied across the country. To provide more insight on the variations in the farm economy, this week’s post considers state-level changes in net farm income during the boom and contraction. We’ve written about the broad trend in the U.S. farm economy several times (most recently here, here, and here), but we know the magnitude of the farm economy boom – and subsequent slowdown- varies across the county. The USDA provides state-level net farm income estimates. By considering each state’s average net farm income from a period before the boom-era (2000-2004) and comparing this to the average net farm income during the boom (2011-2013) we can evaluate the variations (real, or inflation-adjusted, net farm income estimates were used). These results are shown in figure 1 (Alaska and Hawaii are not shown). It’s quite surprising how much variation occurred across the U.S. The largest increases in farm incomes occurred in the Northern Great Plains (Kansas, Nebraska, South Dakota, and North Dakota) and in the Corn Belt (Iowa, Illinois, Indiana, Minnesota, and Michigan). Comparing the averages for these two time periods, farm incomes in Minnesota (+188%), Kansas (+167%) and Nebraska (+156%) were up significantly. In the case of these states, farm incomes more than doubled over the time periods spanning 13 years. For example, net farm income in Nebraska went from an average of $2.5 billion (2000-2004) to $6.3 billion (2011-2013). Another way of considering the magnitude of these changes is how a 156% increase – as an example – would affect $100. After a 156% increase, every $100 of income was equal to $256; a large increase in farm profits. However, it’s very important to keep in mind that the ag economy boom wasn’t felt evenly across the U.S. In fact, some regions completely missed the farm economy expansion. This was especially the case in the Southeast and Texas were net farm incomes across these two periods contracted. In Texas, for example, net farm incomes contracted 34%. That same hypothetical $100 in profits shrank to $66. In fact, 10 states had zero or negative farm income growth when comparing the two periods. Why did these variations occur? One large source of variations would be the mix and types of agriculture ventures happening within a state. Another consideration could be local conditions. Texas, as an example, had several years of drought that resulted in difficult management conditions, including cattle herd reductions during the 2011-2013 period. These conditions likely impacted state-level conditions. State-level variations are also important to consider with respect to changes in farmland values, which we previously wrote about. It is not surprising farmland values in the Southeast were slow to adjust higher given the farm income trends. Figure 1. 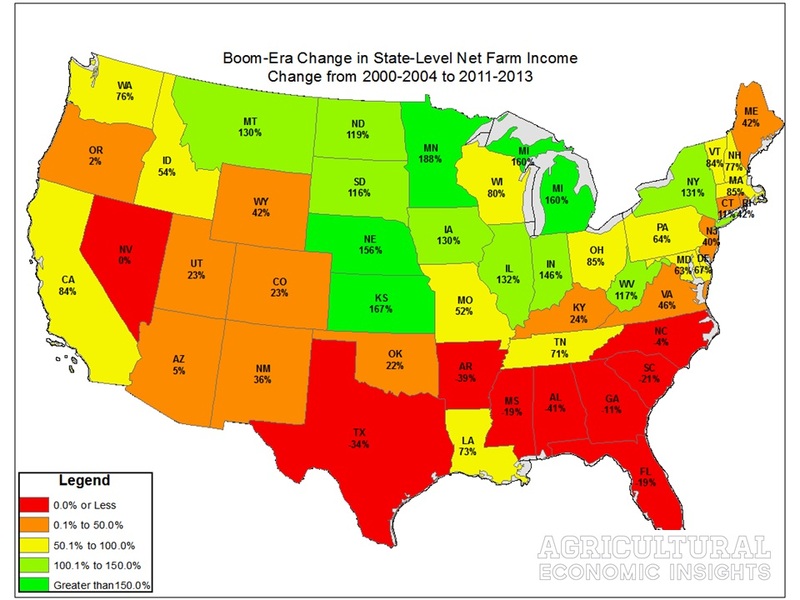 Change in State-Level Net Farm Income, Average of 2000-2014 to Average of 2011-2013. Data Source: USDA NASS. Just as the net farm income varied during the boom varied, so has the contraction. Shown in figure 2, changes in net farm income from the averages of 2011-2013 is compared to the most recent year of data, 2015. Overall, significant contraction in net farm income occurred in the Northern Great Plains and Corn Belt. North Dakota saw net farm income contract 93%. In Illinois – where net farm income declined 101% – actually had a statewide losses, or negative net farm income. Since 1949, state-level net farm income in Illinois has turned negative only one other time, in 1983 during the height of the farm financial crisis. As a reminder, these data are net farm income, not net cash income. Net cash income in Illinois was still positive in 2015. Figure 2. 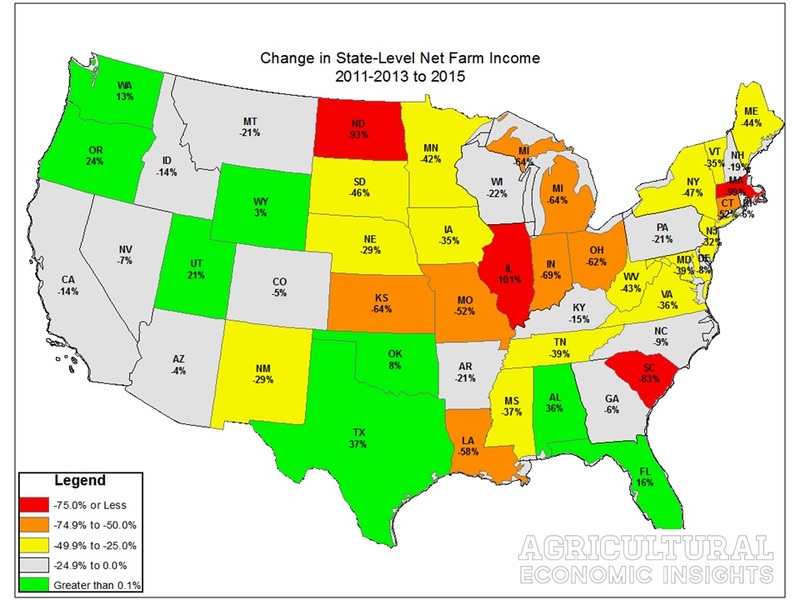 Change in State-Level Net Farm Income, Average of 2011-2013 to 2015. Data Source: USDA NASS. One aspect of today’s farm economy boom that is similar to the 1970’s boom is geographic variation. In Figure 3, the state-level changes from the average of 1969-1971 to the average of 1972-1975 (four consecutive years with net farm income well above average) is shown. Similar to recent years, strong gains also occurred in the Northern Great Plains and Corn Belt states. Also similar, the boom of the era was not as strong in the Southeast during the 1970s. Figure 3. 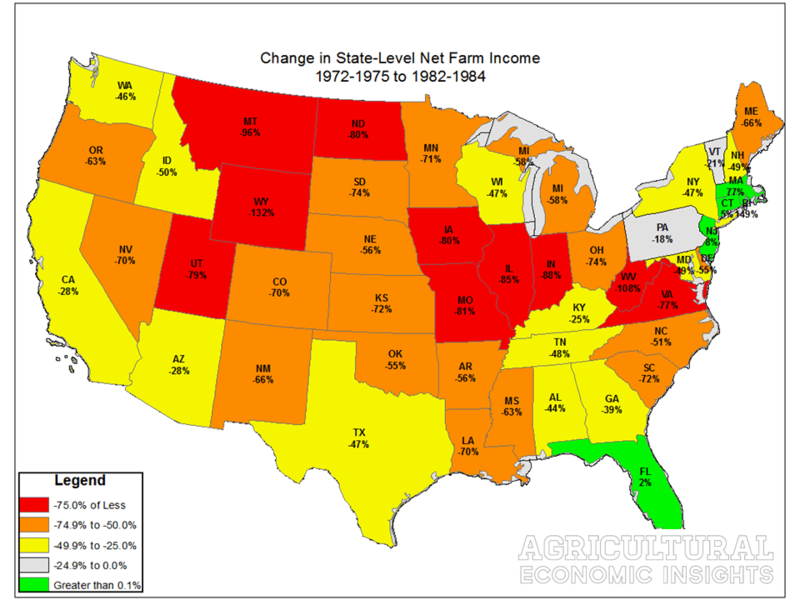 Change in State-Level Net Farm Income, Average of 1969-1971 to Average of 1972-1975. Data Source: USDA NASS. In figure 4, a look at the change in state farm incomes from the boom period (average of net farm income of 1972-1975) is compared to the conditions during the height of the farm economy slowdown (average of 1982-1984). Again, conditions varied by state, with most severe contractions happening in the Corn Belt, where farm incomes fell by more than 80%, and in the Northern Great Plains (where farm incomes fell 80% to more than 100%). In general, areas of the county with strong gains in net farm income also had large contractions. The Southeast, for instance, had modest gains and modest declines. However, this is only true in general and not exactly the case on a state-level basis. Take Missouri as an example. Gains in net farm income were similar to those of Texas, but less than neighboring Illinois (figure 3). By the 1980s, net farm income in Missouri fell a similar magnitude as Illinois (more than 80%) while net farm income in Texas was less severe (down only 47%) (figure 4). Figure 4. 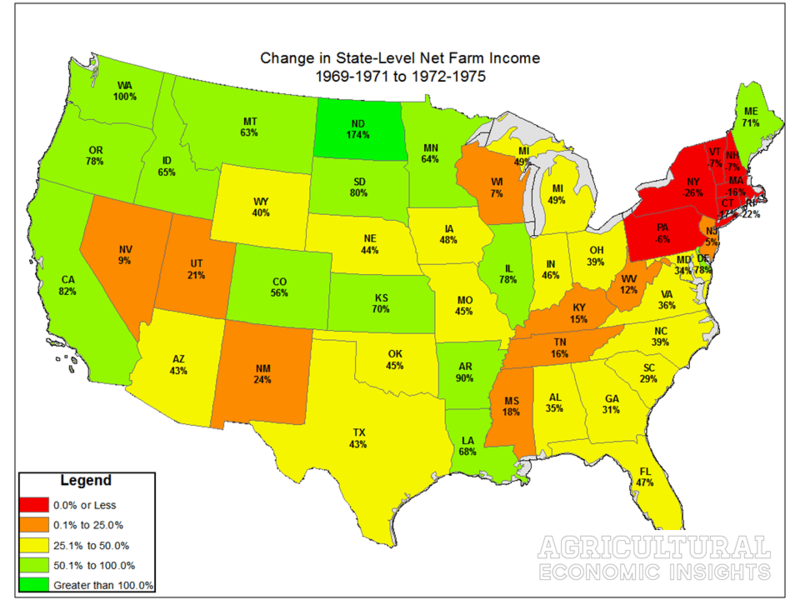 Change in State-Level Net Farm Income, Average of 1972-1975 to Average of 1982-1984. Data Source: USDA NASS. While many – including us- talk about the recent agricultural boom-era, it’s important to note that the magnitude of the good-times varied across states. Although the data are not available, variations would also occur across regions, counties, and communities. In fact, some states experienced declining farm incomes while the overall farm economy experienced significant gains. Just as the economic expansion varied, so has the economic slowdown. Most recently, net farm incomes in 2015 for North Dakota and Illinois were sharply lower – even turning negative in Illinois. Looking back at conditions during the 1970s and 1980s, these variations in boom/busts were also common. Looking ahead, we know the USDA’s latest estimate of national net farm income in 2016 and forecast for 2017 is lower than 2015. Overall, we expect state-level conditions to be lower when the next round of data is available (later this summer). Additionally, areas of the country where net farm incomes fall the most are likely to face more pressure on farmland values and face tougher financial conditions.